Wondering if there's much tonal difference between a Gibson CG compared to a Gibson Tennessean - anybody here had a chance to A/B them? I've had my '89 CG for a couple of years now and it's by far my favourite guitar ever. Just yesterday I bought another one, a '96 model. Desperately needs new strings (waiting for a batch on order) so at the moment it's nowhere near as nice to play as my '89, but she's very pretty. Paul Yandell told me once that he and a Gibson engineer developed the Tennessean. Apparently Gibson wanted a "mid priced" guitar in the CA line. Paul said that the Tennessean literally WAS a 335, just with two cutaways! I suppose pickups/strings/etc. would have a lot to do with the sound, but I never cared for this guitar because it had no Bigsby tailpiece. I think there was much less difference between the old (original) Gretsch Tennessean, and the old Gretsch Country Gentleman! I think what David meant is the Tennessean has only 1 cutaway and the 335 has 2. I have owned both guitars Gibson CG and Tennessean and both were great guitars. I may be wrong but the Tenny and the 335 have different pickups. Somebody correct me if I am wrong. I had a 1990 Gibson Tennessean and a 1987 Gibson Gent at the same time in the mid 1990s. They were both excellent guitars and I liked them both. I sold the Gent and kept the Tennessean because it has the smaller body and is more comfortable for me to play. The neck felt the same on both of them to me. It is my favorite guitar of any I have ever owned. I have a young cousin and a younger buddy who both play guitar and they really liked both guitars, too...they played rock on them and enjoyed that sound. 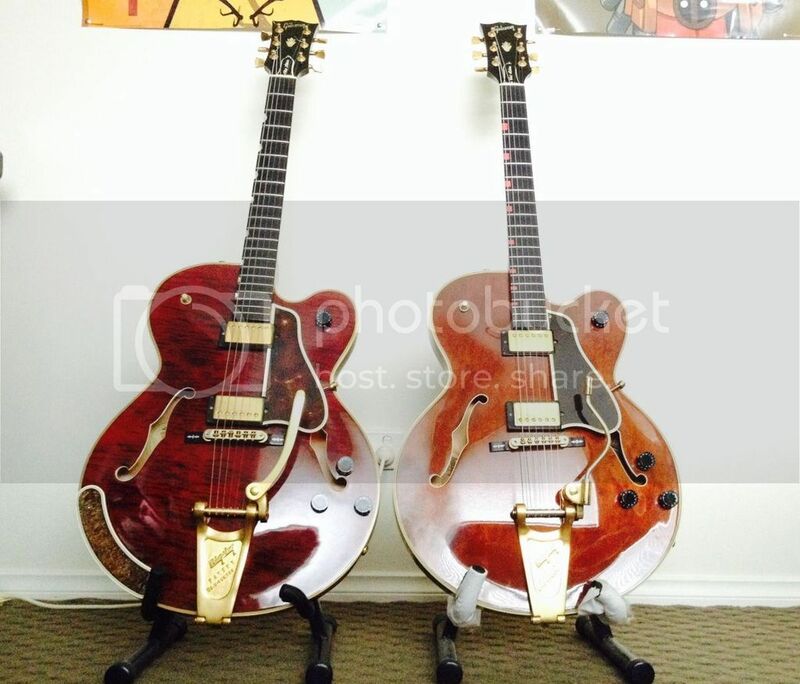 I think both of the Gibson Chet Atkins models have unique neck pickups not found in Les Pauls, solid bodies, ES 335/345/355 thin line or arch top electrics. They have Gibson 492R neck and 490T bridge humbucking pickups installed. I played my Tennessean with out a tremolo for several years, but then I installed a Les Trem on it and it feels like a Bigsby with a spring and all, but is installed as part of a stop tail piece, so the guitar didn't have to be modified. I don't know if you can buy them any more. I use this guitar mainly for jazz, its peculiarity is that it really sounds so unique, truly a character and a unique voice.